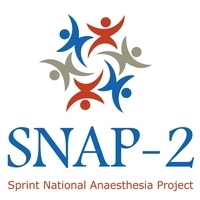 The first peer reviewed paper from the 2nd Sprint National Anaesthesia Project: Epidemiology of Critical Care Services (SNAP-2: EPICCS) has been published in the BJA and received wide national press coverage. The paper addresses the incidence and reasons for cancellation of inpatient surgery in the NHS. A key finding was the cancellation of between 1 in 10 and 1 in 7 of inpatient surgeries during the week of the study in March 2017. Lack of both critical care and general surgical beds as well as lack of operating theatre capacity was concerning. In addition, of 14,936 patients undergoing elective, non-emergency inpatient surgery, 1,499 (10%) had previously had the same operation cancelled at least once before. "One in seven NHS operations 'cancelled or postponed' "
Huge congratulations and thank you to the thousands of local collaborators who worked so hard on SNAP-2 and to the SNAP-2 Fellow Dr Danny Wong, senior clinical leads Prof Ramani Moonesinghe and Dr Steve Harris, and the RCoA Research team. Further outputs from SNAP-2 will be forthcoming. Please Note: All news links were active at the time of publication. The HSRC is not responsible for the content or maintenance of external weblinks.